In order to enjoy continued protection from Comodo Internet Security, you will need to renew your license when it is due to expire. The Product Activation Wizard will start. Select 'Existing Comodo User' checkbox in 'Enter Customer Details' area, enter your login and password and complete the payment procedure. The License key will be sent to you by email. 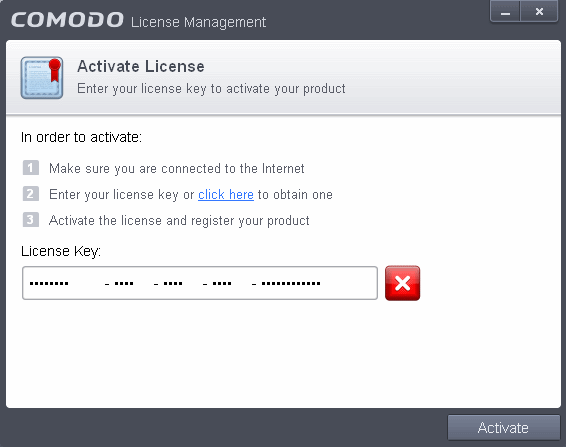 Enter the license key and click the 'Activate' button. 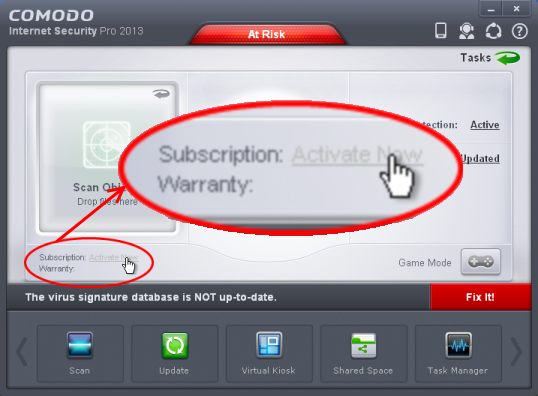 After successful validation, your subscription will be activated and a confirmation screen will be displayed. If you are renewing a license for the same CIS product then entering the license key will upgrade the license without requiring re-installation. If you are upgrading license types, then installation of the new product type will begin automatically. You may need to restart your computer to finalize the upgrade. Click the the 'Renew Now' button in the alert screen and follow the same purchase and activation procedure explained above.